Quantitative assessment of cardiac time volume curves is extremely important to evaluate changes in cardiac function especially diastolic function. Time volume curves derived from Cardiac MRI have high temporal and spatial resolution and are ideally suited for such an analysis. However due to significant time involved in creating these curves, not many centers have adopted such an approach for analytical purposes. We have developed and validated a technique for automatically propagating short-axis left-ventricular contours manually drawn near end-diastole and end-systole to all other time frames in a cine cardiac MRI study using a non-rigid registration (NRR) algorithm. We applied this methodology to create time-volume curves in 2 distinct clinical populations: Mitral Regurgitation (MR) and Hypertension (HTN) and compared them to the normal volunteers. These 2 clinical groups represent volume and pressure overload conditions respectively. We also compared the indices derived from time volume curves to diastolic radial and circumferential strain rates derived by cine myocardial deformation analysis (cMDA) method. All procedures were performed per the institutional guidelines after obtaining informed consent. Standard Cardiac MRI views were obtained on a GE 1.5 T system using ECG gated steady state free precession (SSFP) technique with following parameters: slice thickness 8 mm, Field-of-view 40 × 40 cm, scan matrix 256 × 128, flip angle 45°, TR/TE = 3.8/1.6 ms, temporal resolution ≤ 50 ms. 38 normal (nrm), 106 HTN and 45 MR were imaged. NRR was used to propagate contours manually drawn at end-diastole and end-systole to all other time frames in the acquisition. The LV volume at each timeframe was computed by summing the volumes defined by the contours in each slice. cMDA based on NRR techniques were also used to measure in-plane myocardial deformation between imaged cardiac phases in a set of mid-ventricular short-axis slices. These deformations were used to compute a time series of diastolic strains and strain rates. Peak ejection rate (PER) and peak early filling rate (ePFR, corresponds to E wave) were higher in MR as compared to HTN or nrm (Fig. 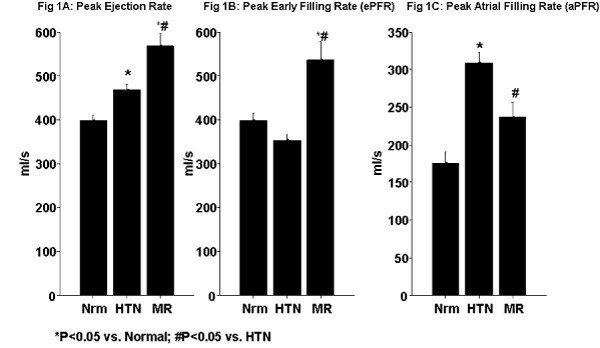 1a, 1b, p < 0.05), while the late filling rate (aPFR, corresponds to A wave) was higher in HTN as compared to MR and nrm (Fig. 1c, p < 0.05). On comparison with diastolic strain rates, note was made of lower early circumferential relaxation rate (p < 0.05) and greater late circumferential relaxation rate in HTN as compared to MR (p < 0.05). Although the early radial relaxation rates were similar in 3 groups, the late diastolic radial relaxation rate was greater in HTN as compared to the other groups (p < 0.05). Quantitative assessment of cardiac time volume curves is extremely important. We applied automated non rigid registration algorithm for contour propagation to create and compare time-volume curves in two distinct clinical populations and evaluated their relationship to diastolic strain rates. : A) Peak ejection rate; B) Peak early filling rate (ePFR); C) Peak atrial filling rate (aPFR). Our results indicate that there are differences in the LV filling and ejection patterns under varying physiologic conditions (greater pre-load vs. greater afterload). This is associated with differences in the diastolic strain patterns. Both strain patterns and time-volume curves provide complementary clinical information and may be extremely useful in assessing response to therapeutic modalities.